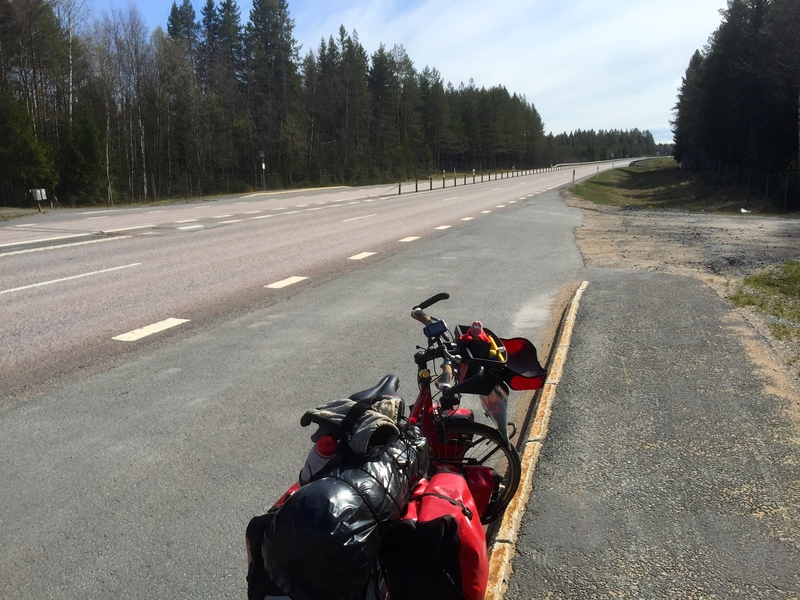 The title of this post refers to the fact I’ve been seeing Sundsvall on signposts for at least the last 400km, and now I’ve finally made it! It appears it’ll be replaced by Stockholm now; looking forward to being a tourist when I get there. Any recommendations on a cheap place to stay? I think I’ll look up a hostel or backpackers. Today started off cold, misty and drizzling. I was loathed to emerge from my tent, and still tired from yesterday’s efforts, however I wasn’t going to get very far by just thinking about it, and besides, I needed the loo, so I crawled out of my pit to a new day. As always it was alright once I was up, however I quickly packed up my sleeping bag to avoid the temptation to get back in it. Taking a quick walk around the campsite, saying good morning to those who were up, I noticed lots of different nationalities represented by the camper vans. There were Swiss, Belgium, German, Dutch, Swedish, Austrian, and Finnish, and no doubt others that I missed; everyone likes a touring holiday it seems. I had a chat with a German couple on their way up to Nordkapp; they were hoping to see some reindeer, I confirmed this wouldn’t be a problem, just try not to run them over. I packed up my wet tent, which would still be wet tonight unfortunately but needs must, and pedalled off, bidding goodbye to the owner who gave me a few route tips; can’t beat local knowledge. 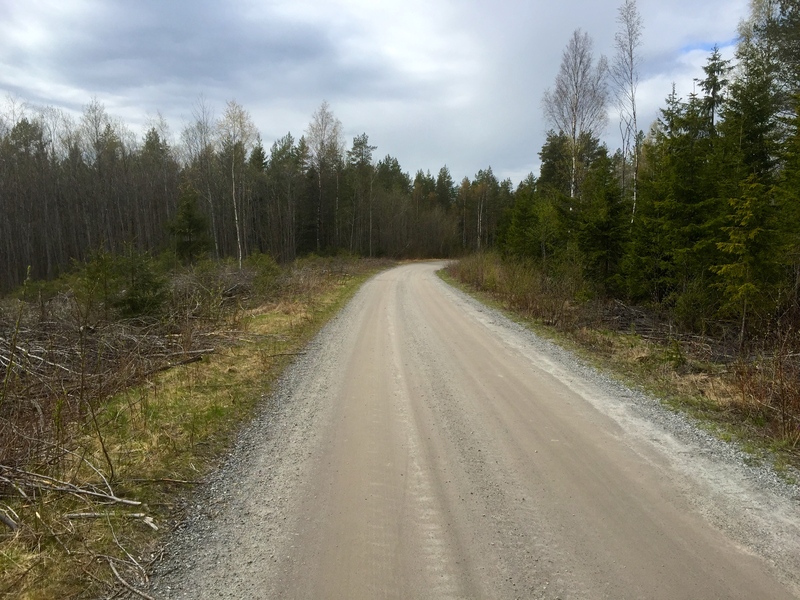 The first part of the ride was all off the E04, taking the older side roads, some unpaved, down to Harnosand. 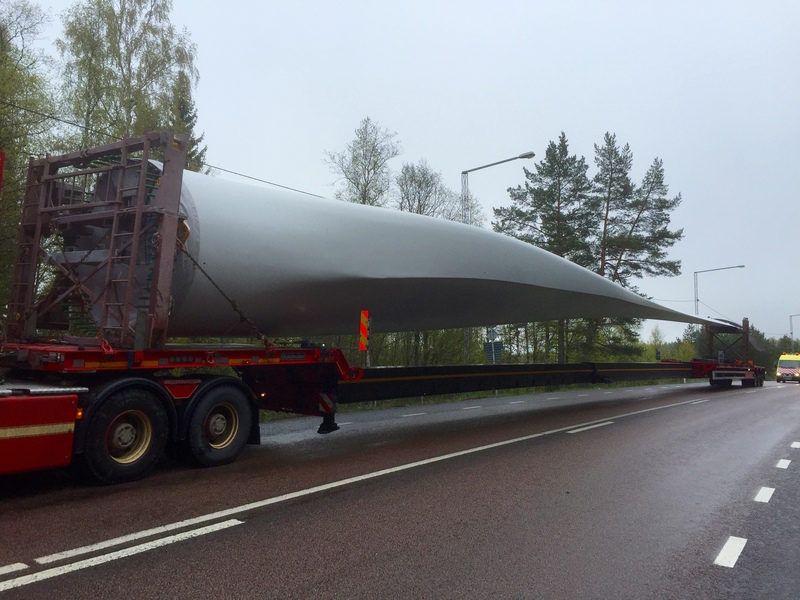 At one point I passed a convoy going in the other direction transporting a wind turbine blade. It was huge! It was lovely riding through the forest, without any traffic, although I did have to keep an eye out for pot hole ambushes. The forest was so quiet, apart from the birdsong, and I stopped for a few minutes just to listen. Any concerns I had about the next few days just drifted away as I listened to the birds singing, and to top it off the sun emerged from behind the clouds. 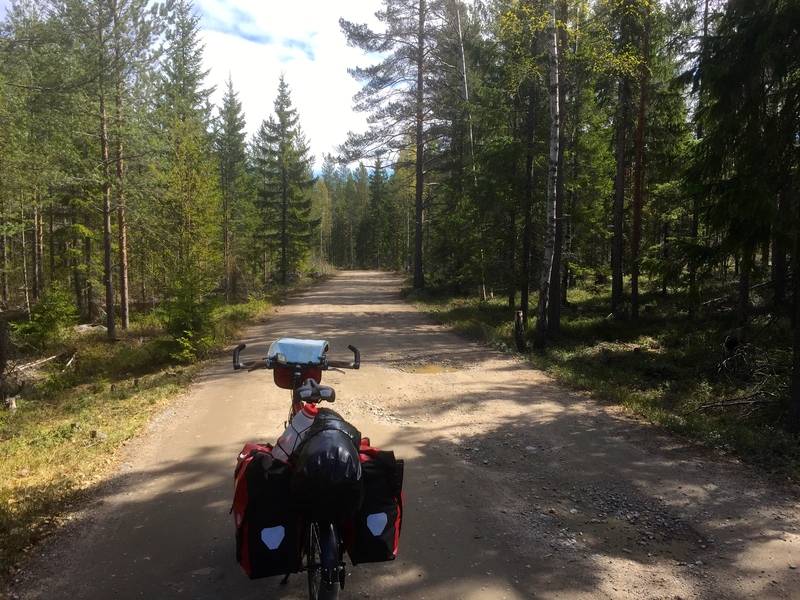 The quiet road was replaced by slightly busier roads as I approached and then pedalled into Harnosand, passing a few cows on the way in, the first I’ve seen in Scandinavia; Lobster moo’d at them, the rascal. I didn’t stop for long, just to grab some cash from an ATM, and munch a few biscuits to keep up my energy levels; Oreos are superb touring sustenance. 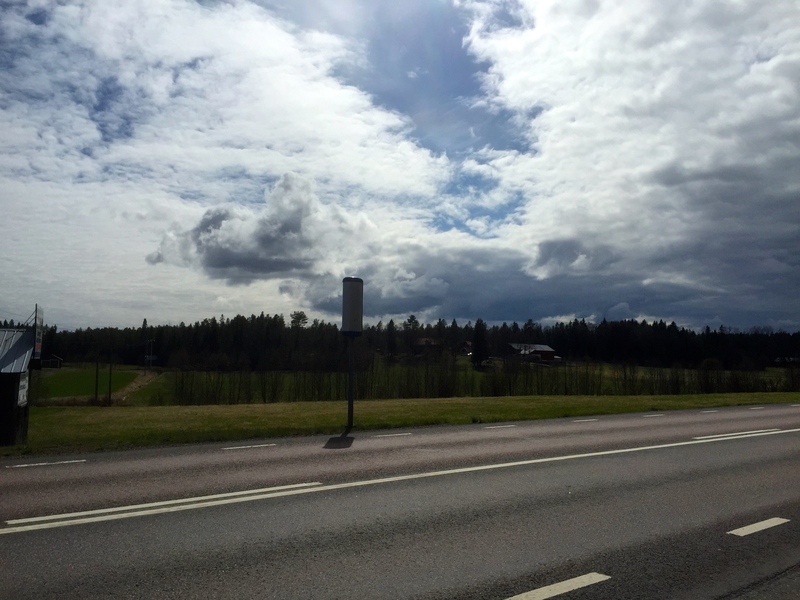 To continue my journey to Sundsvall I had to rejoin the E04 down to near Timra, which was mostly alright as there was a wide hard shoulder, and only a bit of buffeting from passing artics. The worst bits were crossing the bridges over the estuaries near the airport, where the hard shoulder runs out, plus it started raining. Then it all got a bit confusing. I wasn’t sure where the E04 turned into motorway, which I’m not allowed to cycle on, and had no desire to anyway. 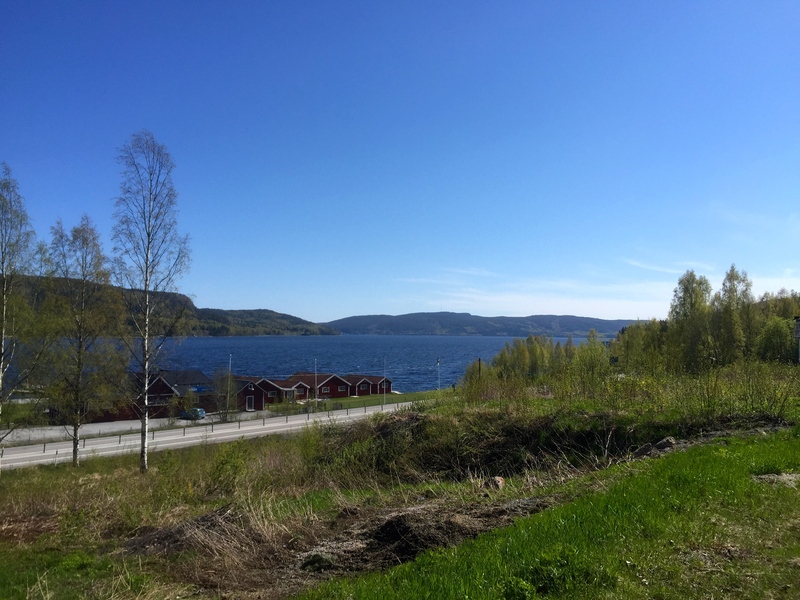 I turned off, crossing the River Indalsalven (again), and heading slightly North, but couldn’t find the right road or cycle path to take me on a direct route to Sundsvall. It got a bit frustrating as I pedalled through suburbia, twisting and turning along various small roads marked as cycle paths, which gradually took me in the wrong direction, and then onto the 331 which goes in completely the wrong direction. Approaching meltdown I stopped and re-evaluated, then backtracked slightly and cut across to the 330. The 330 headed roughly North West up the valley through which the Indalsalven flows. I really needed to get across it, but had no choice but to continue up towards Karsta and Indal, where there’s a bridge. 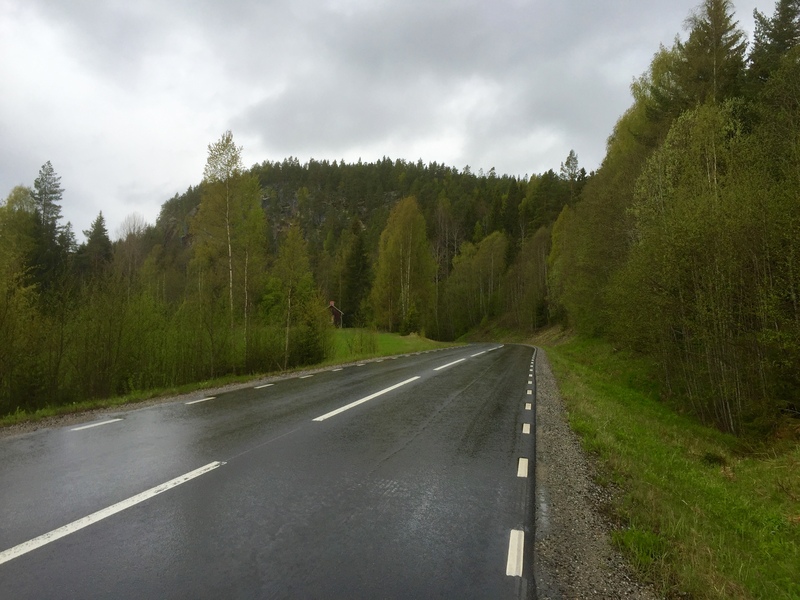 Despite the rain, and the detour which added at least 25 kilometres on to my ride, it was nice pedalling up the valley, with little or no traffic to speak of, just mountains, pine forest, and bird song. The smell of pine sap was really strong as I cycled along, probably enhanced by the damp. It was refreshing and invigorating, and I began to enjoy myself again after the earlier frustrations. 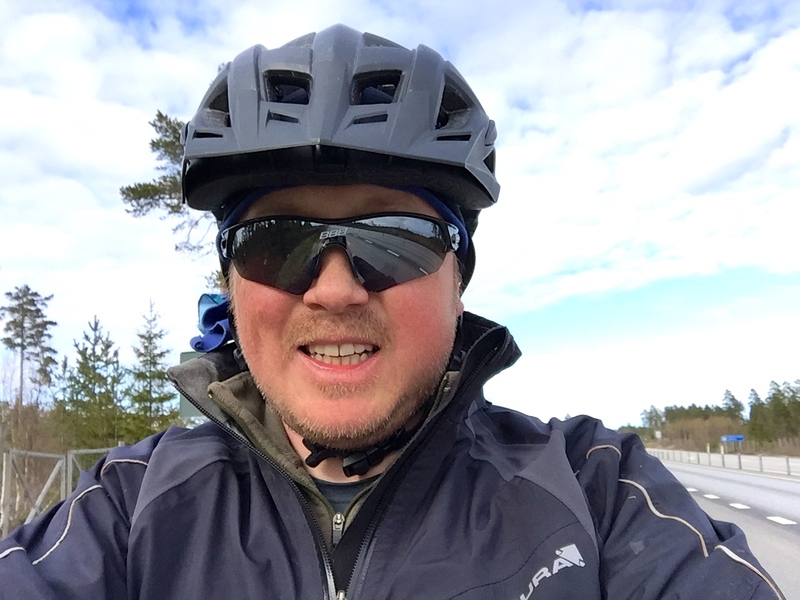 I did have one strange thought; I hope the pine sap isn’t like the blood of Dryads and Ents slain by the loggers cutting down trees – you do think some weird things when pedalling for hours, or at least I do. 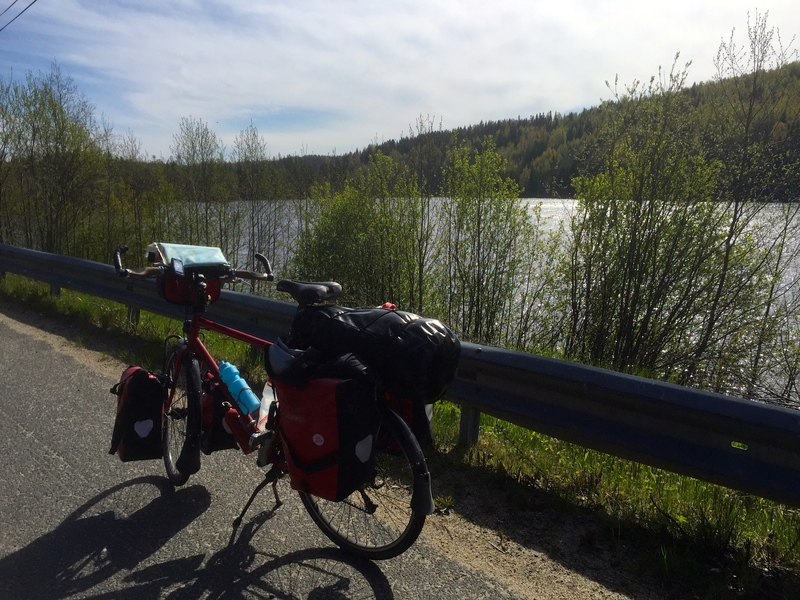 After reaching Karsta I turned left on to the 86 heading South again, crossing the river and immediately having to pedal up a large hill. My Garmin got confused at this point and decided I was going downhill, and I was suddenly below sea level; perhaps the pine sap had gone to its head. I was rewarded at the top of the climb by the sun coming out, and the rain stopping, revealing a patchwork landscape of fields, forest and small dwellings nestled here and there; I like the word dwelling…dwelling…go on, say it…dwelling…it sounds nice. As I pedalled along, passing various farms, I noticed more people out mowing their lawns. This has been a frequently observed activity over the last few days, and is probably the first mow of the season. People seem to mostly have ride on lawnmowers over here; I approve. There’s all sorts of spring cleaning going on, not just mowing; strimming, pressure washing, pruning, digging, it’s all happening now spring has sprung. 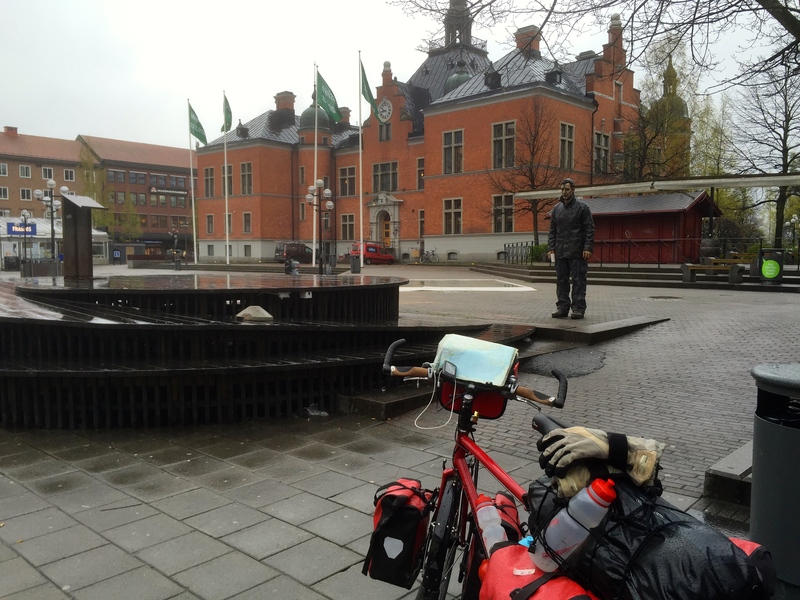 Riding through sun, then rain, then sun, and repeat, I eventually reached Sundsvall, and cycled through the town. It’s another big University town, built in the early 17th century. It’s burned down 4 times, which sounds a bit unlucky. The Russians did for it the first time in 1721, in the Great Northern War, and the last time was in 1888, after which they decided stone might be a more durable building material. I noticed far more shops, bars and restaurants here, compared with anywhere else in Sweden I’ve visited so far, and lots more people out and and about, including many of the youth of today lounging about in the central square, complete with various forms of fashion and hairstyle; pretty much like Norwich city centre really. 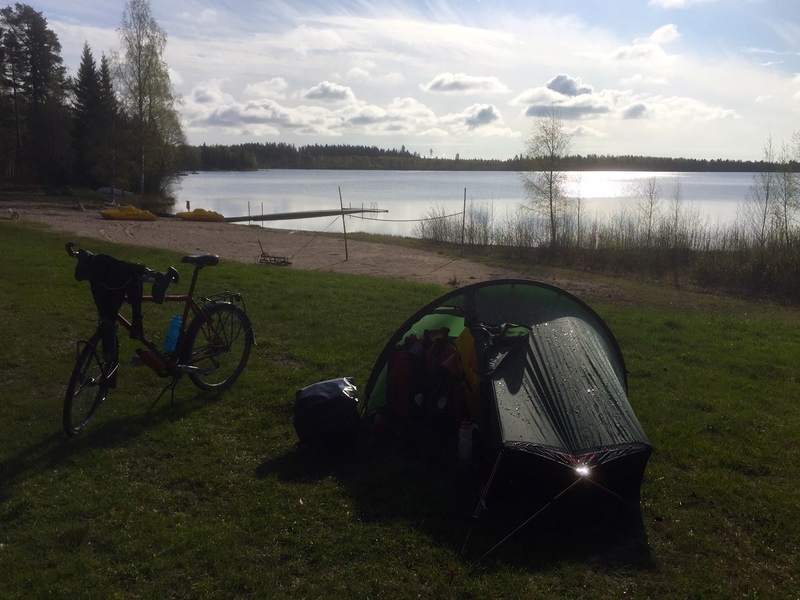 As it was getting late I didn’t dally, especially as it was raining again, and pedalled on to find the campsite near Stockvik. 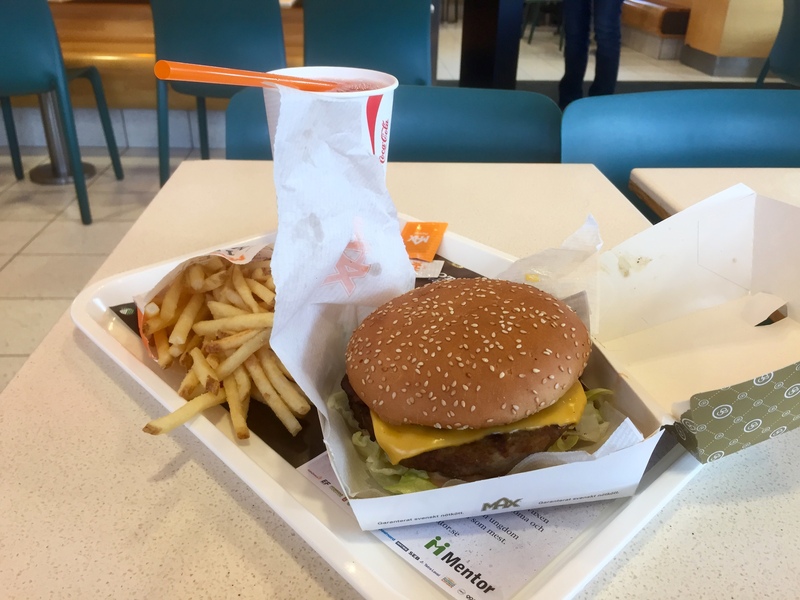 I spotted a Max burger joint on the way out, just off one of the ‘Cycleparets’, and couldn’t pass up the opportunity for some hot and calorie rich food. Their burgers are much nicer than Mcdonalds; they actually taste of beef! 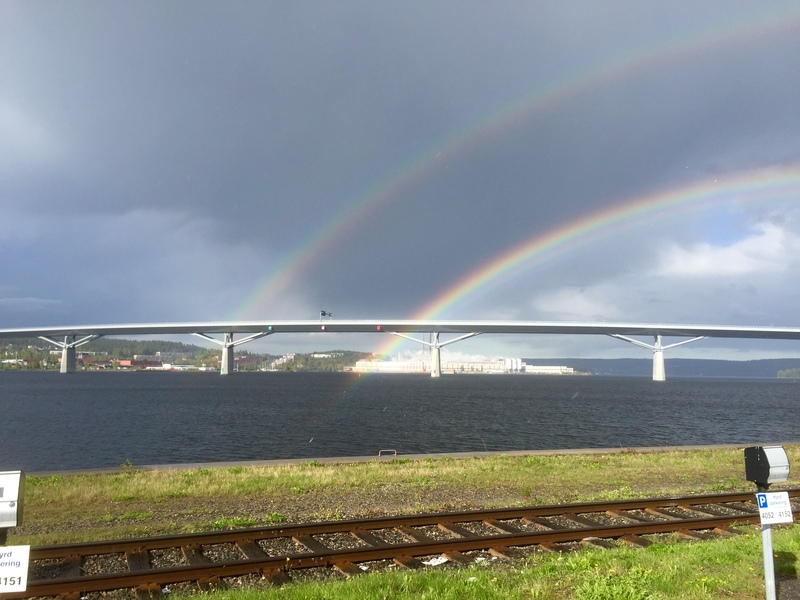 Continuing on through the rain, and passing a pretty impressive bridge complete with rainbow, I reached the Flasians Campsite, whereupon then sun came about again, hurrah. Oh, and I passed a tandem tourer going the other way, giving them a wave; first tandem tourer I’ve seen this tour. Flasians occupies a lovely spot right on the coast, with a small beach and a lovely view. I unpacked and put up my tent, then went for a walk on the beach whilst it dried out in the sunshine. As usual there weren’t many other people about, just a few camper vans, and one young Norwegian couple touring by car for a month whilst they rock climb in various places. I chatted with the latter for while, and it got me thinking about doing some climbing when I get down to the Callanques in the South of France (near Marseille), if I can meet up with a few of my old friends from round there. For the first time I felt slightly nervous about leaving Smaug unattended, having seen a note pinned to one of the campsite doors asking that whomever ‘borrowed’ a tablet return it to reception, so I locked him up before going for a shower and food. I’ve noticed my right hand is going a bit numb when I’m cycling, and I now have a slight case of Ulnar nerve compression/inflamation. It’s not particularly painful, and is a common cycling complaint if you’re riding for hours, day after day; just means I have a slightly weak grip for some hand motions. I’ll have to adjust my riding and hand position a bit and it should fix itself. A day off in Stockholm will help. Before bed I went of another walk along the beach, gazing out across the sea to a lighthouse with its slowly spinning light. Again it was very peaceful, serene and beautiful. Even the three factory chimney’s off to one side looked pretty; they’ve put different colours lights around each of the chimneys, giving them a nice glow. 75 miles (121km) covered in about 7.5 hours, so getting the average up, however thinking about a shorter ride tomorrow. P.S. 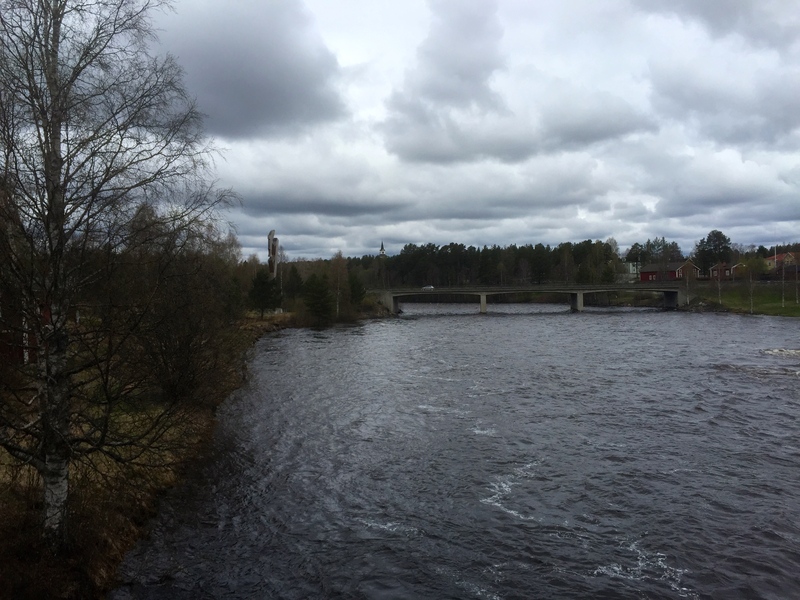 Blog posts are a day behind, and I’m now in Hudiksvall. Will catch up tomorrow, depending on how the ride goes! Probably going to be a long one to Gavle. 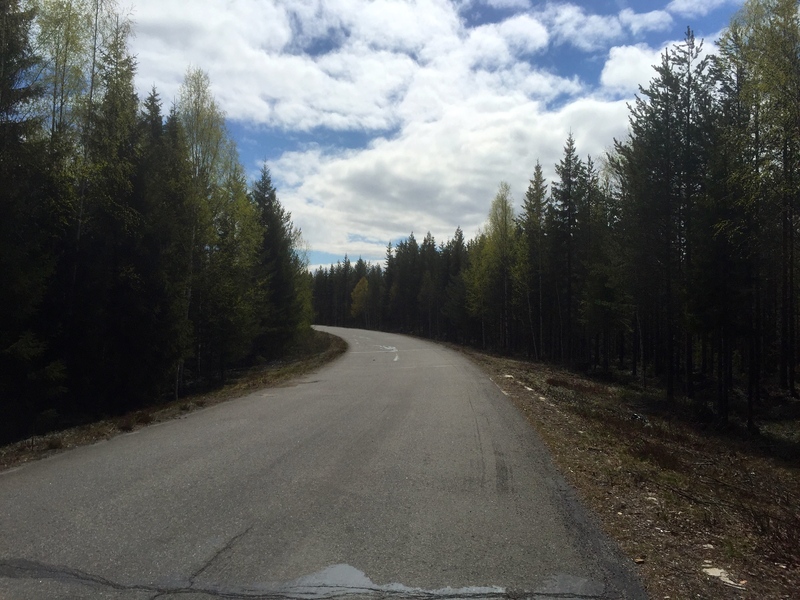 This entry was posted in Self Propelled 2015, Sweden and tagged Adventure, Bicycle Touring, Bike, Charity, Countryside, Cycle Touring, Europe, Expedition, Gulf of Bothnia, photos, Self Propelled 2015, Sundsvall, Sweden on May 21, 2015 by SelfPropelled. I think I’m now roughly on the same line of latitude as the bottom of Iceland, having pedalled nearly 1000 miles from the Northernmost point of Europe in 2 weeks; no wonder my legs are aching tonight. Nordkapp seems like quite a long time ago, and the scenery has certainly changed. The frozen lakes and snow have given way to pine forest, and clear blue water glittering in the sunshine. 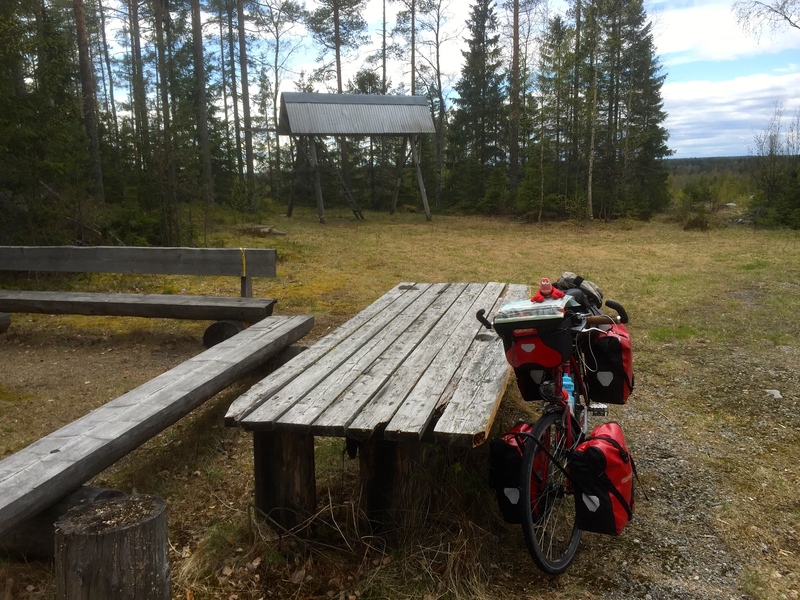 I was chatting to the campsite owner this evening and he reminded me that I’m still in northern Sweden really, having pedalled to the Snibbens Campsite near Ramvik; Harnosand is the nearest big town. This country really is very long! I think I’m only about 300 miles from Stockholm, depending on to what degree I avoid the E04, so definitely getting there. It took me 7.5hrs of pedalling, with climbs totalling 1,355 metres; this could again be why my legs, and especially my knees for some reason, are aching. And my hands, did I mention my hands? And my arms. In fact most things. It rained overnight, quite hard. You hear these things in a tent, in fact you can hear anything and everything in the immediate vicinity pretty well. There was one particular bird that didn’t shut up all night, flying around the lake tweeting constantly; not tweeting as in Twitter, but twittering as in squawking, if you see what I mean, or hear what I’m saying, or something. It didn’t keep me awake long but it was definitely a flying varmint! I was consequently a bit slow setting off this morning, not leaving until getting on for 10.00. 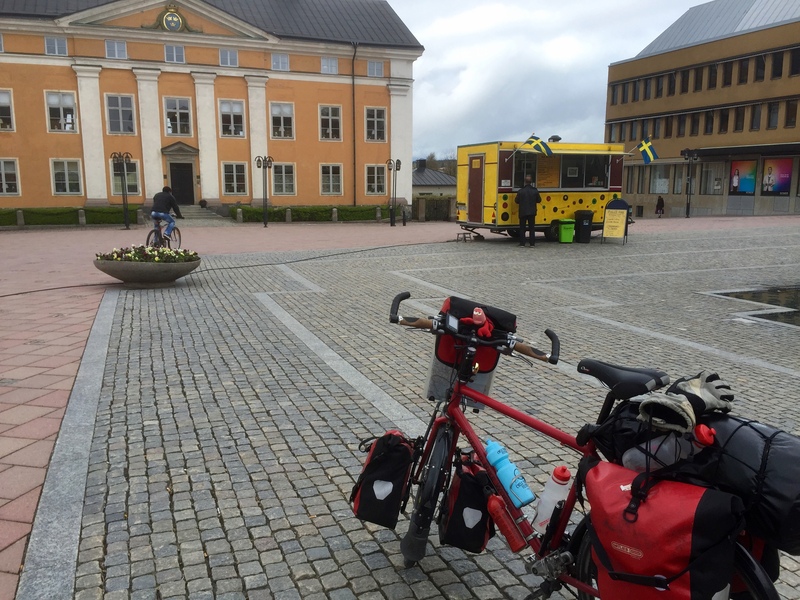 I initially joined the E04, having little choice in the matter, and rode to Ornskaldsvic, a medium sized pleasant town. On the way in I almost literally bumped into another cycle tourer, Tomak (sp?) 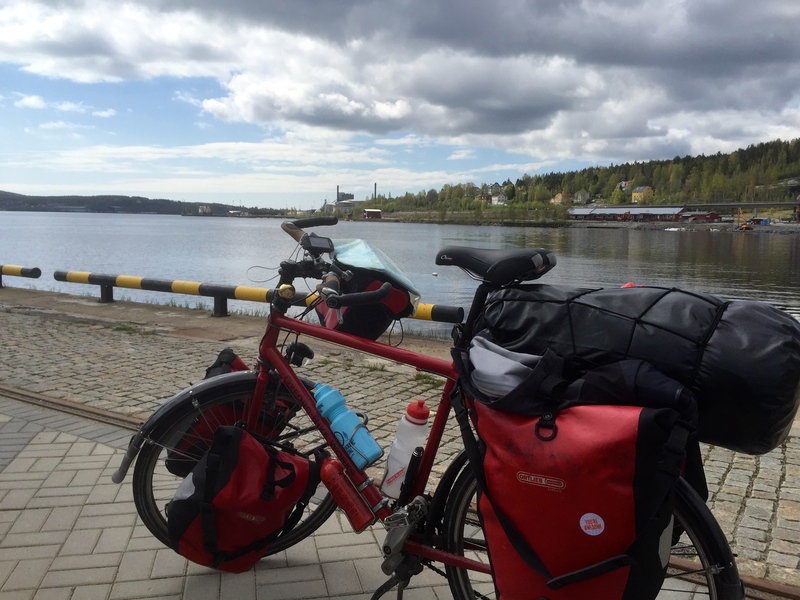 from Germany, who has cycled up from near Hamburg, and intends to travel around the whole Baltic coastline before returning home. 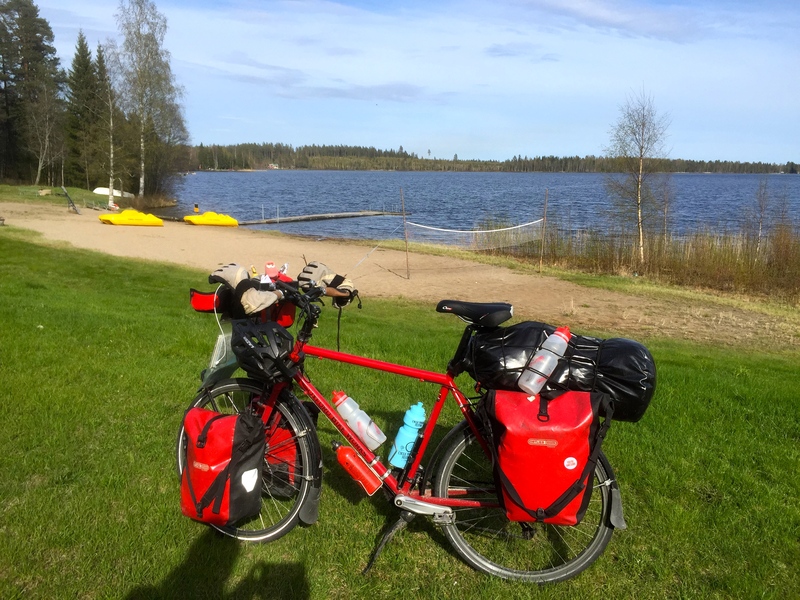 He mentioned Estonia, somewhere quite a few cycle tourers have spoken about lately; sounds like a place to add to the list to visit. We both took a break to exchange tips on the routes ahead. 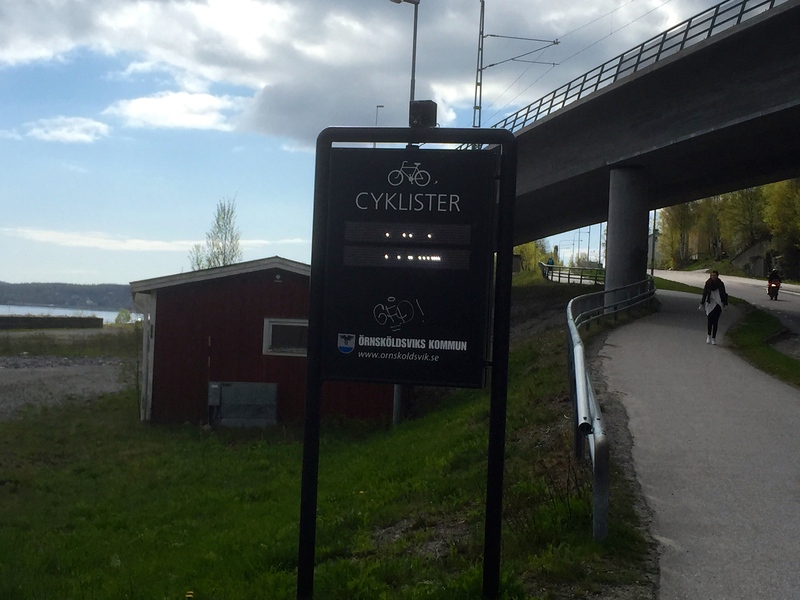 Tomak told me he’s been following the black cycle route signs, which I’ve only seen a few of so far, but apparently get more frequent. These take you on routes that avoid the busy main roads, like the E04, but add on a lot of kilometres as a consequence; so more pleasant riding but will add on a lot of time. It was good to meet another tourer; we’re a scarce breed up here at this time of year. We wished each other luck before pedalling off in opposite directions. Leaving Ornskaldsvik I passed a rather incongruous sight; the Bishops Arms, down by the docks, maybe pubs will be increasing in frequency now. 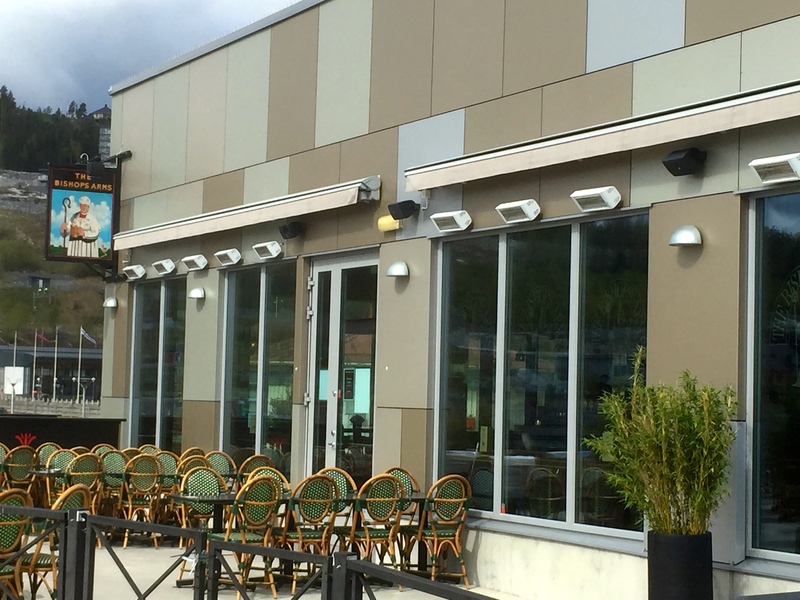 If so beer could be back on the menu; abstinence is over-rated. 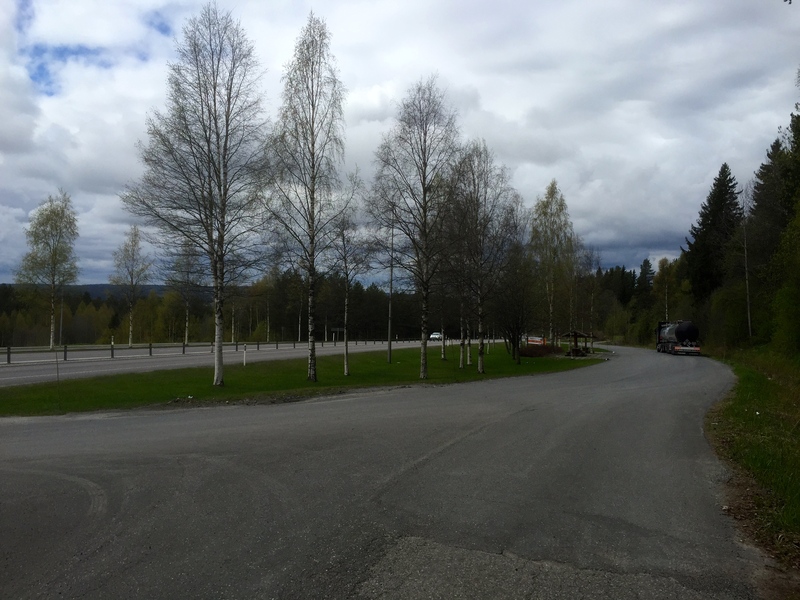 I left the E04 after Ornskaldsvik, taking quieter roads for a bit. In fact I reckon I spent at least 50% of today’s ride off E04, which although introduced more hills and distance, was a welcome relief. I saw this sign riding up out of the town; not sure what it was about. The side roads are so much quieter, and the scenery was lovely to cycle through, if a little taxing on the legs. I compensated for tired legs by eating lots of Haribos. These were a staple on my Bike around Britain tour, and I’m pleased to report they sell them in even more varieties in Europe; great for topping up your energy levels. 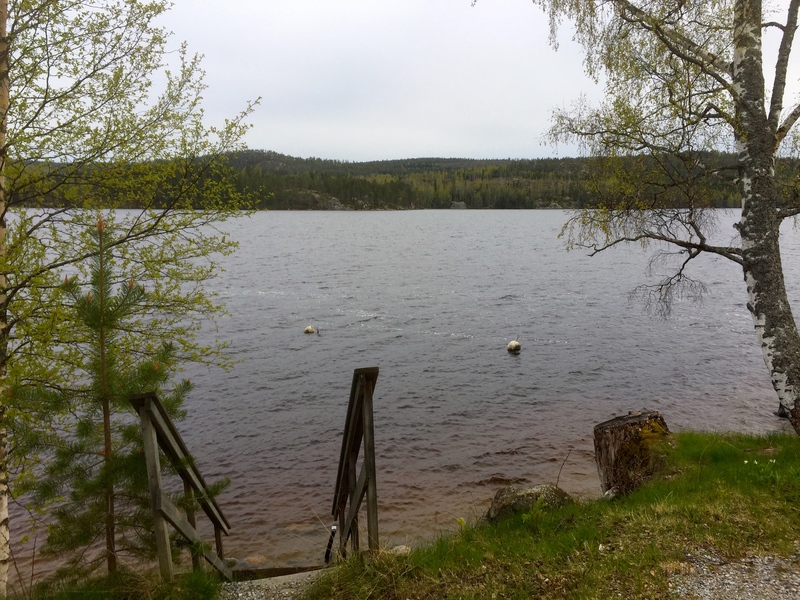 As I cycled along winding roads, up and down hills, passing lakes and glimpses of the Baltic, I saw much wildlife. A fox regarded me suspiciously as I rode past, before dashing into the undergrowth. I can also report Sweden has hedgehogs and badgers, although I only know this because I’ve seen them squashed on the road, sadly. The Hoga Kusten (High Coast) has lots of interesting places that would be good to come back and visit over a few days. There’s a centre in the park in the above picture, where you can climb a Via Ferrata; I haven’t done one of those in years, and would love to again. I might see if I can do a bit of climbing when I get down to southern France, where I hope to visit a few old friends from when I lived in Marseille. Back on the nature front; I saw some of those Emus again, although I’m not pretty sure they’re not Emus but White Storks. They’re really big, and a couple flew off as I rode by – enormous wingspan. I spotted a Swallow too, or it might have been a House Martin. Now I’m cycling a long way, however these birds can give me a run for my money, migrating over 10,000km from Africa. Here are a few more photos from my ride along the back roads away from the E04. Sadly no beavers to report; I kept an eye out for them as they’re supposed to live in these parts, but they must of all been hiding from Lobster. The alternative route meant I covered more kilometres than I expected to. One advantage of the E04 is it does get you down the coast quickly, relatively speaking, but you can miss a lot if you stay on it all the time. Saying that several of the sections I rode on today were quite nice, with a wide hard shoulder; it’s just the constant lorries which get annoying, and their buffeting. I passed under the E04 and pedalled up to a town called Klockestrand, then crossed the high bridge over the River Angerman; think that’s what it’s called. It’s a really wide river, and it was a long way down from the bridge. There were actually two bridges to get over this river, the second being a bit further on over another section of it, and even higher. The campsite owner later told me this is the old bridge, and there’s a newer one on the E04 you can cycle over, but there’s no cycle path so you take your life into your own hands; glad I went the way I did. Made it over both bridges, phew, and first day I haven’t had to wear a coat! Feeling tired I stopped at a service station for a hot dog, and bought some Pringles for extra calories, before completing the final stretch down to a campsite near Ramvik – Snibbens campsite. The owner was out walking his dog as I pedalled down to reception; the 2 year old labrador greeted me enthusiastically, finally a dog that doesn’t bark at cyclists. I can recommend Snibbens campsite. 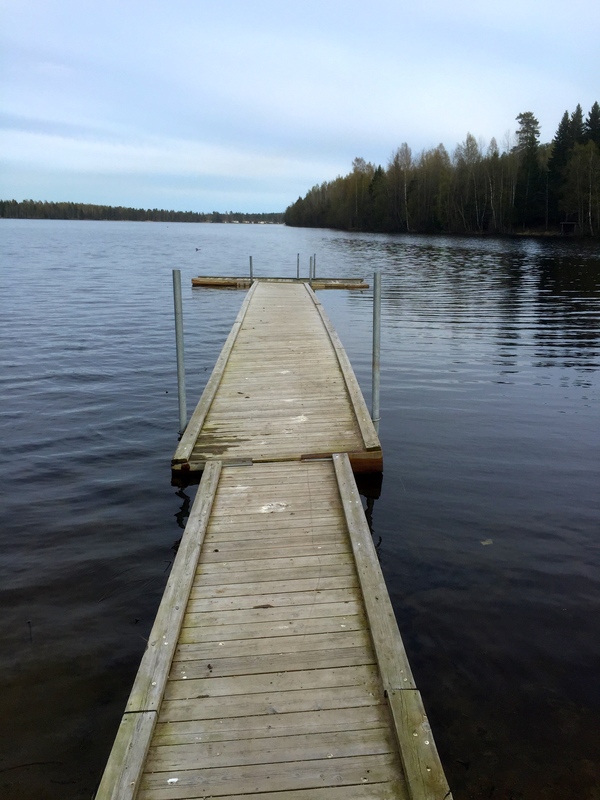 It’s a lovely peaceful spot, next to a lake, with friendly owners who live on site. 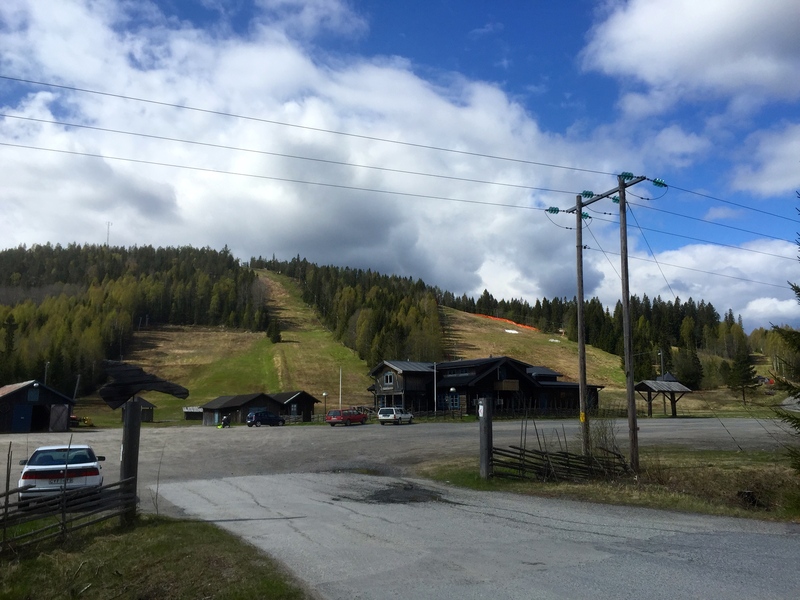 I had a great chat with the owner about my ride, and about northern Sweden. One of the things he mentioned shows how people have the same concerns all across northern Europe; immigration. On my cycle down I’ve been noticing a lot of people begging outside shops, on the street and probably living rough. 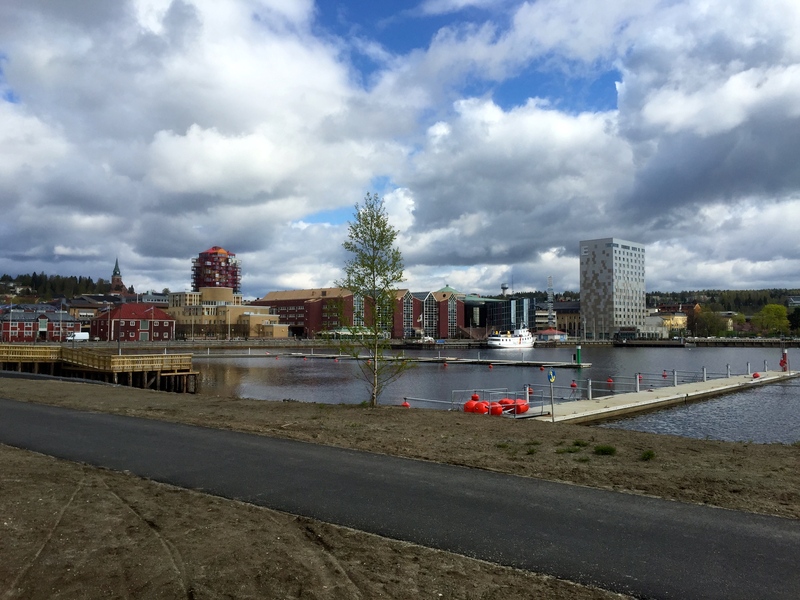 He said that this is a relatively new thing, only having started in the last few years as more people move to Sweden from eastern Europe and beyond. We both agreed it’s a sad thing to see so many people living rough, probably having come here seeking a better life, or escaping something worse at home. It would be good to do more to help them, but it would be better perhaps if the problem could be fixed at source, so people don’t feel they have no alternative but to move to wealthier countries, and then find themselves homeless and penniless. It will be interesting to see how this varies as I progress through Europe; I know it’s the same in France. Being the only camper on site I had use of the communal room to myself for the evening – a chance to chill out after a hard day’s ride, and look at my maps. I need to work out where I’m going after Stockholm, and how to get over into Denmark. 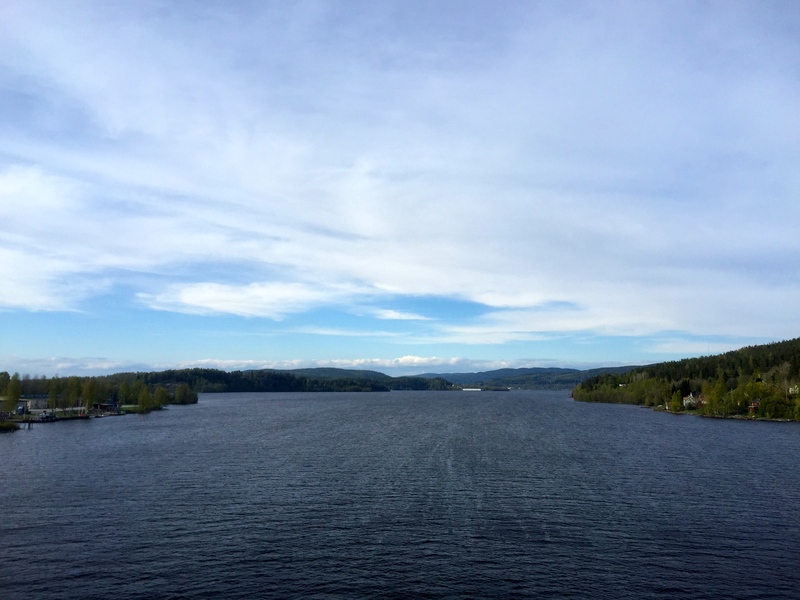 Off to just South of Sundsvall tomorrow, if all goes according to plan. Hopefully I’ll be in Stockholm Sunday or Monday. 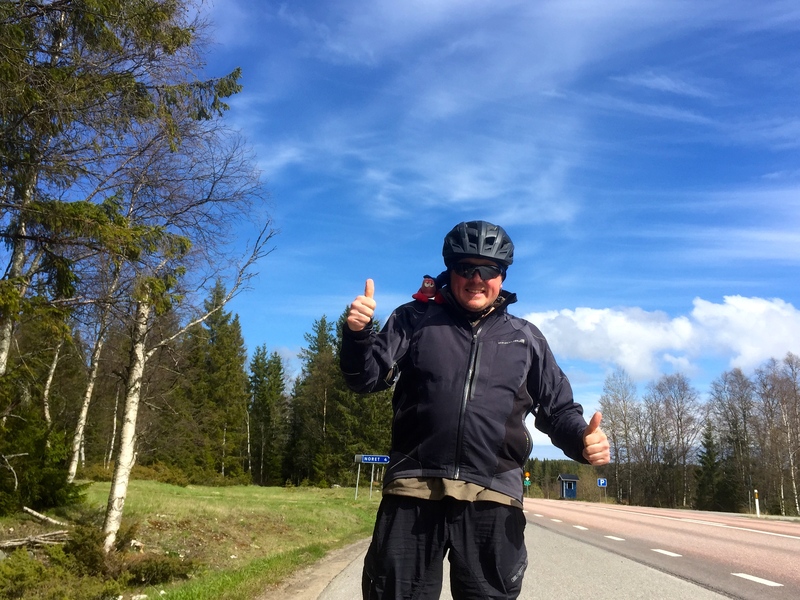 This entry was posted in Self Propelled 2015, Sweden and tagged Adventure, Baltic, Bicycle Touring, Bike, Charity, Countryside, Cycle Touring, Europe, Expedition, Gulf of Bothnia, Haribo, High Coast, Nordkapp, photos, Self Propelled 2015, Sweden, varmint on May 20, 2015 by SelfPropelled. 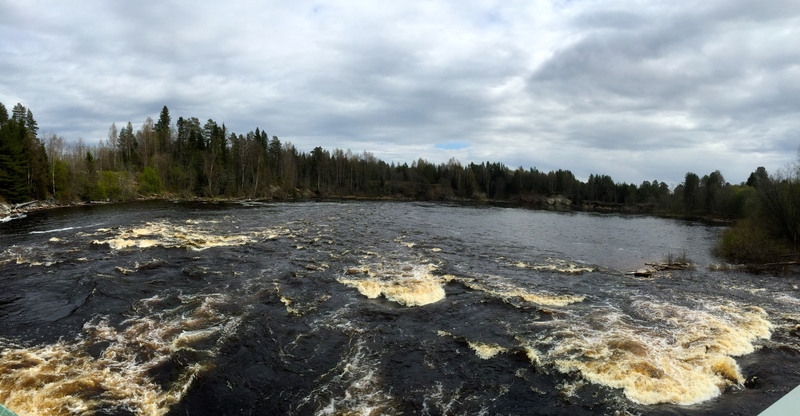 The last couple of days have got me quite a way down the coast of Sweden, alongside the Gulf of Bothnia. I made the mistake of looking at an overall view of my planned tour, and realised how far I have to go, so figured I’d put a few big mile days in now to speed things along, and to allow me a few recreation days when I get down to France and Spain. I’m still planning on visiting Stockholm so I’ll probably have a day off then anyway. I wasn’t sure where I was going to stop for the night when I set off from Byske. 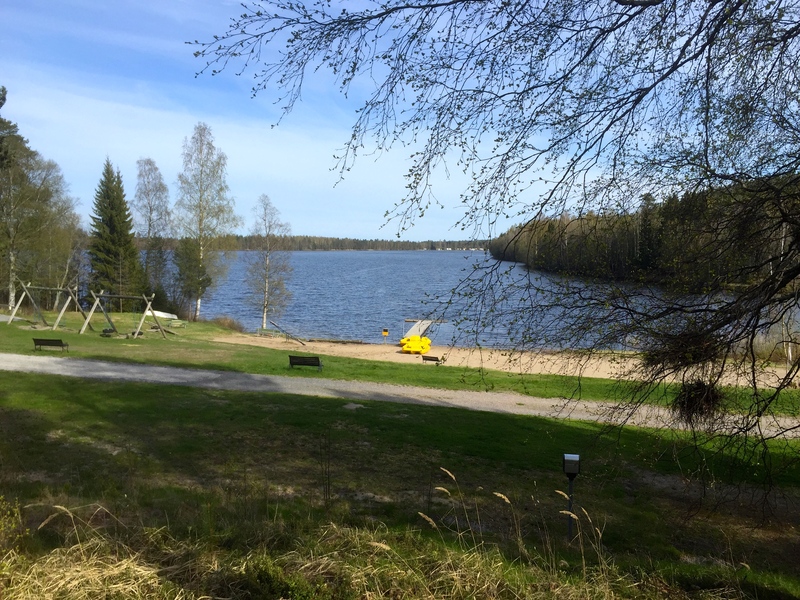 There are allegedly two campsites around a place called Bygdea, according to my map, but I didn’t know if they’d be open or not, which left wild camping or cycling all the way to Umea. Quite a few of the campsites round here don’t open properly until June; not much call for it until it gets a bit warmer. 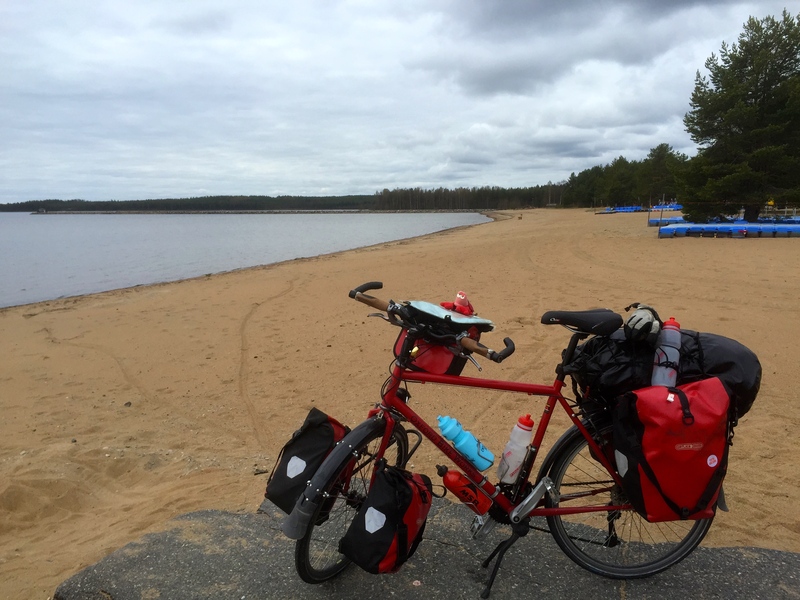 Pedalling off from the campsite I stopped in by the beach, looking out over the waters of the Baltic/Gulf of Bothnia. 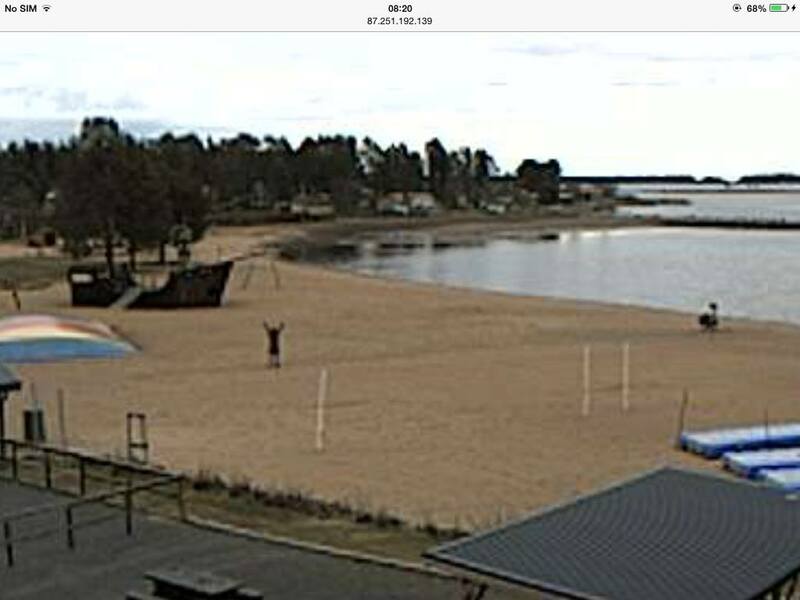 It was all very peaceful, but I felt like I was being watched, and not by a Russian submarine; sure enough the stalkers from home were at it and had spotted me on the webcam. I gave them a wave then set off; it’s fun seeing where they might spot me next! I couldn’t find the back road the girl at reception had mentioned, or at least couldn’t be sure I wasn’t about to embark on a massive diversion, so I rejoined the E04 after a brief tour of Byske town. I stayed on it for most of the day, therefore not a lot of interest to report unless you like big lorries with two trailers, dust, and slightly hair-raising narrow sections with crash barriers closing you in. 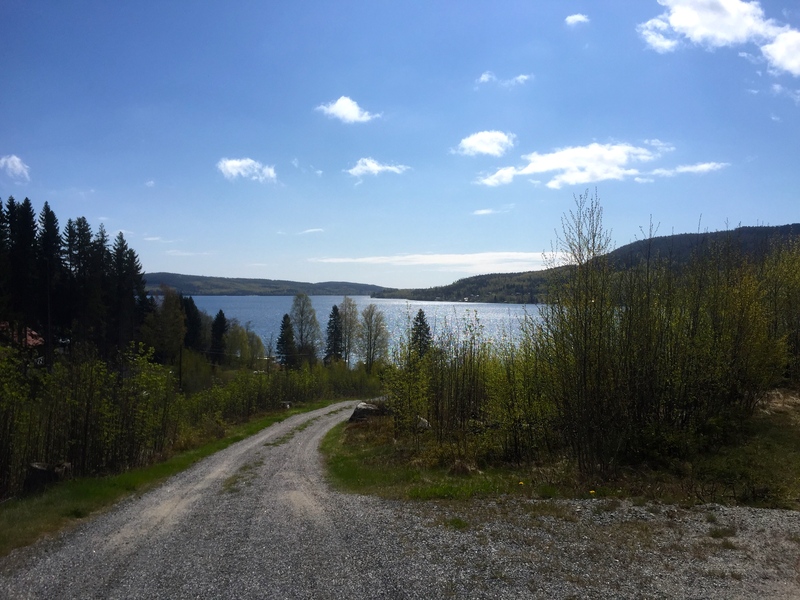 I had a bit of a break from the E04 around Skelleftea, for about 20km, taking quieter roads that run alongside it, and didn’t take me too far off course. Unfortunately there don’t seem to be many roads that run parallel to the main route, they all branch off North or South. Someone at the Byske campsite, I think one of the rather inebriated dog show attendees, told me you pronounce Skelleftea like ‘She left you’; they found this hilarious. I took a couple of cut throughs, hoping for the best, to join up the small roads. The E04 wasn’t in fact too bad compared with previous days. A lot of it turned out to be single carriageway, with a good hard shoulder at least 1m wide, and with a slight tailwind and not very many hills the kilometres flew by. I set a new record for the fastest 40km on Smaug; 1hr 48 mins, not bad for a fully loaded touring bike. The scenery did start to change, with the appearance of meadows, and even a few fields being ploughed by tractors. There was still many a pine tree in evidence, and at times it felt like pedalling through Thetford Forest at home, albeit on the wrong side of the road, and with more hills. I also saw a lot more birdlife again, including a few really big birds; do they have Emu’s in Sweden? I really think they don’t, unless they’ve escaped from somewhere. I could have sworn I saw an Emu, but maybe it was a big stalk, or a pigeon in disguise. There were the usual geese, migrating somewhere, as well as swans, and quite a few what I can only assume were Curlews from the look of it. All good stuff for twitchers, however my bird identification skills have somewhat lapsed since being a member of the Young Ornithologists Club as a kid; did see a few cool hawks I’ll have to look up. Another different thing about Sweden; the cars. For one thing some of the tyres sound odd. Some cars still have their snow tyres on, which make a very distinctive noise compared with normal tyres, the small studs rattling down the road. And then there’s all the classic cars around. It must be a popular hobby in Sweden, restoring old American classics; I’ve seen several old Chevrolets and a wonderful Pontiac. Moving into the modern era I’ve also been passed by a few muscle cars; Corvettes, a Farrari, and lots of cars making satisfying growling noises, if you’re into that sort of thing. 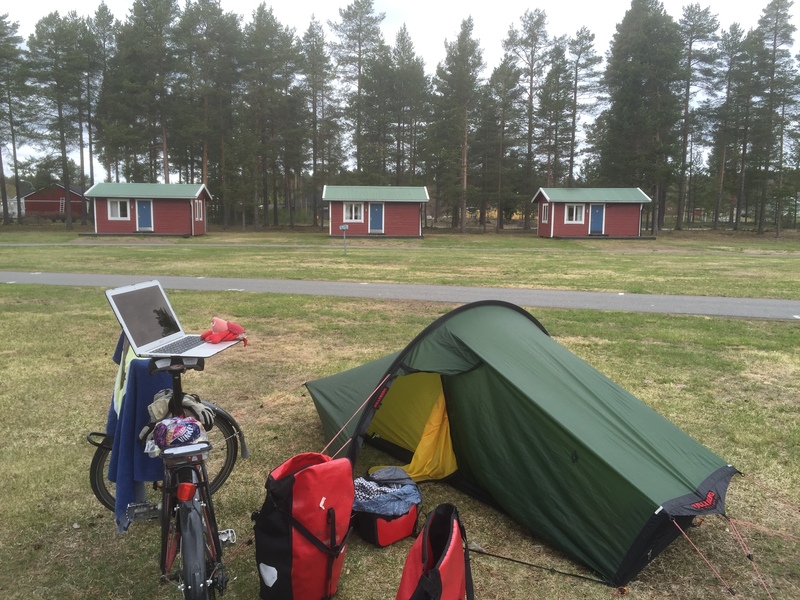 After discovering there really aren’t any campsites around Bygdea, I put my head down and pedalled for Umea. 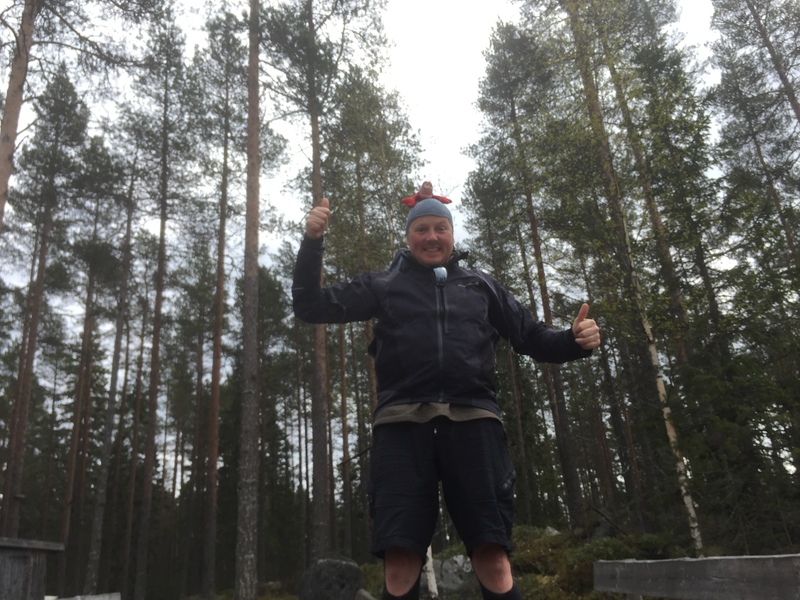 It was getting late but my legs felt fresh, and I was in the zone, so I decided to head for the First Camp campsite. 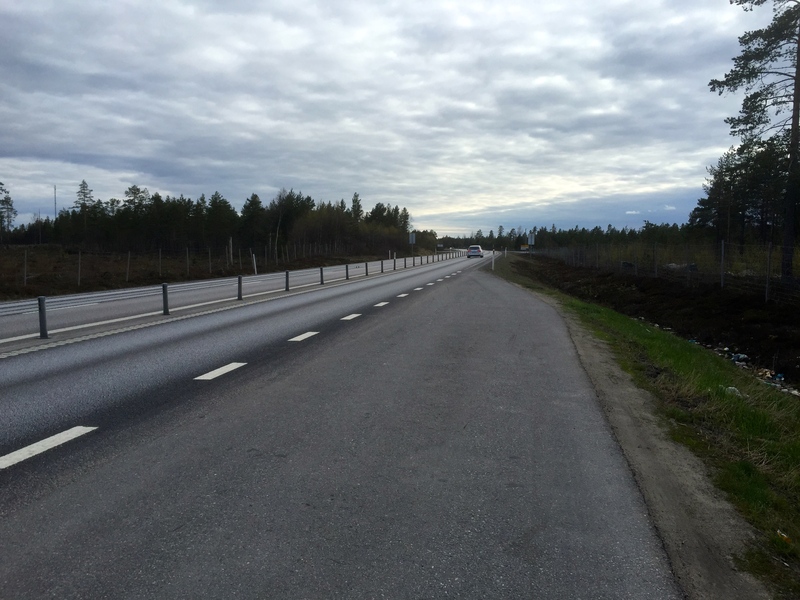 The E04 stayed relatively kind and the kilometres continued to fly by. 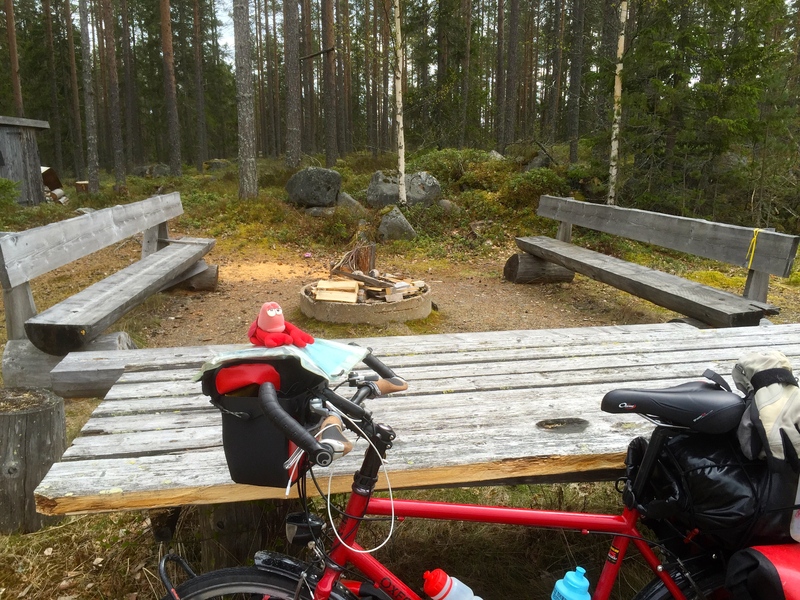 I pedalled to the outskirts of the city, Sweden’s 12th largest and a big University centre, and found the campsite just off the ring-road, very convenient. Tired but I’d made it! Reception was closed, it being Sunday and gone 18.00, but I pitched up anyway and would sort it in the morning. The one drawback of this is you can’t get into the toilet blocks for a shower, or the kitchen, as you need a key card. With a all the dust and grime from the road a shower would have been welcome, however I settled for a wash from an outside tap instead; needs must. It wasn’t long before I decided to get some kip, after demolishing bread, cheese, salami, a ready to eat expedition pack of curry, and of course chocolate; it’s quite hard to keep eating enough calories to replace what you burn off, but also quite enjoyable. I fell asleep pretty swiftly, after a very satisfying day’s riding. I wasn’t aching in the morning, which I was somewhat surprised yet pleased about. 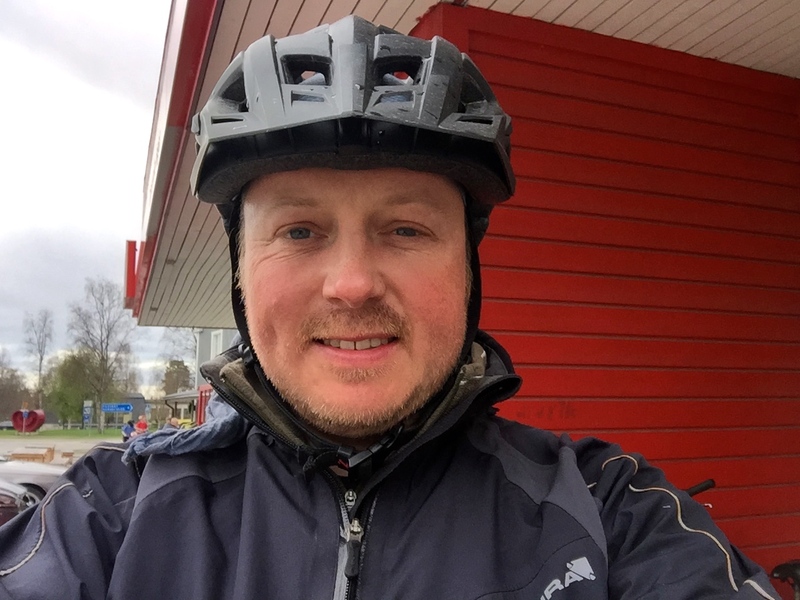 I say wasn’t aching however my posterior was, and still is a bit; lots of hours in the saddle tends to have that effect – padded shorts help, as does chamois cream to prevent chafing. I think I’ll need to change my saddle at some point as this one isn’t quite right. The bike in general is performing very well to date, with nothing needing fixing. It’s just a matter of keeping the tyres pumped up, and things lubed. Like yesterday I wasn’t quite sure where I’d be stopping today, however there were allegedly several campsites en-route, and if all failed I’d find a quiet spot amongst the pines, away from any ants nests; some of them are huge, must get a pic. 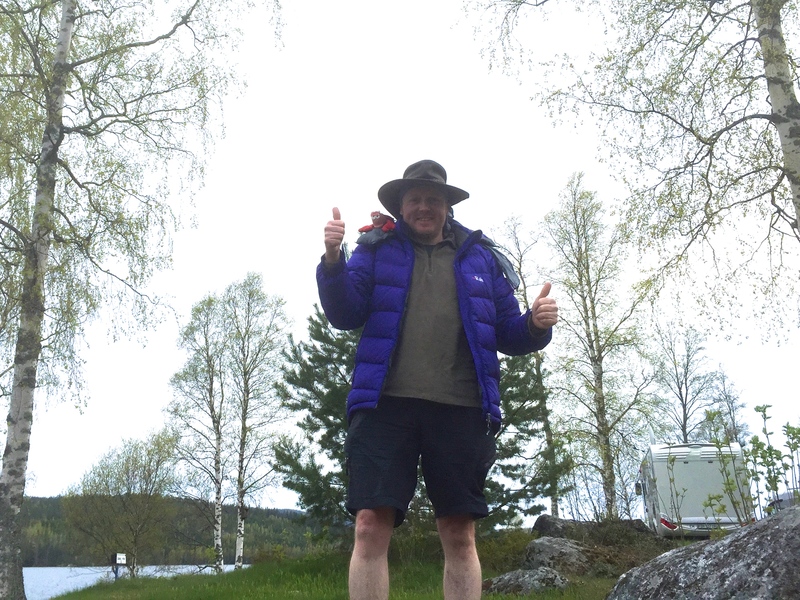 It was raining when I packed up; not a good start, having to pack away a wet tent, however with many kilometres yet to pedal I thought I’d better get underway. 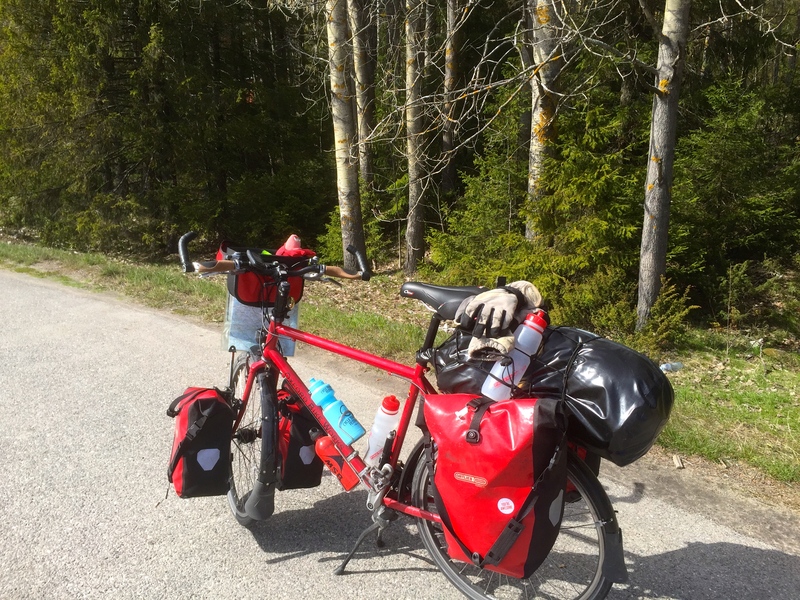 There was a big hare hopping around as I stuffed things into panniers; nice to see, and not the first I’ve seen in Scandinavia. It reminded me of the Mad Hatter from Alice in Wonderland, but I decided not to follow it, not today anyway. I haven’t seen any rabbits at all so maybe they haven’t gotten this far North. 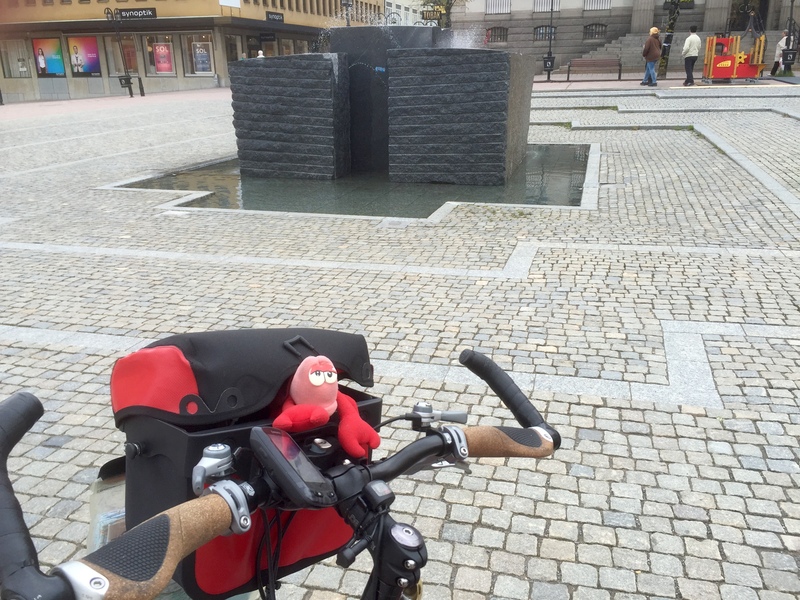 At least I was dry, but I needed to get pedalling to stave off the cold. The expedition beard is coming along but doesn’t provide much insulation as yet, must concentrate harder on growing it. I’m not sure I’ll keep the beard very long. It’s nice not having to shave when it’s cold, but I’m not a massive fan. 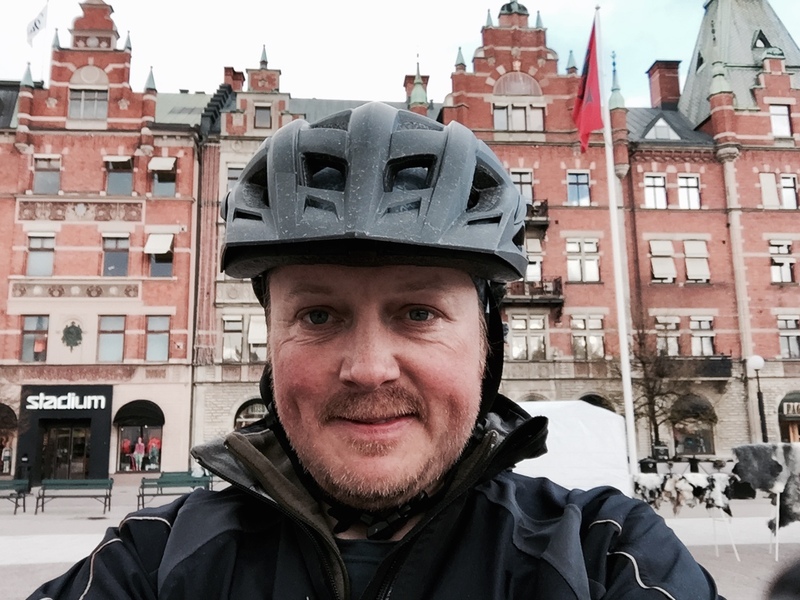 I’ll keep it going until I leave Sweden, then have a beard review session and see what the consensus is between Lobster and I on keeping it, or going with a more streamlined affair as I pedal through Denmark. 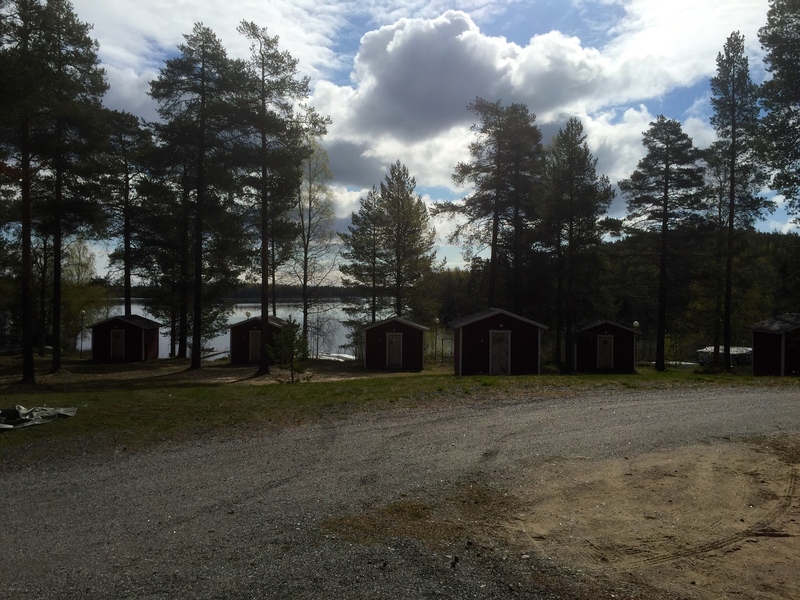 On the way out I stopped at reception to pay, and had to buy a Swedish Camping Key (SCR) card too. 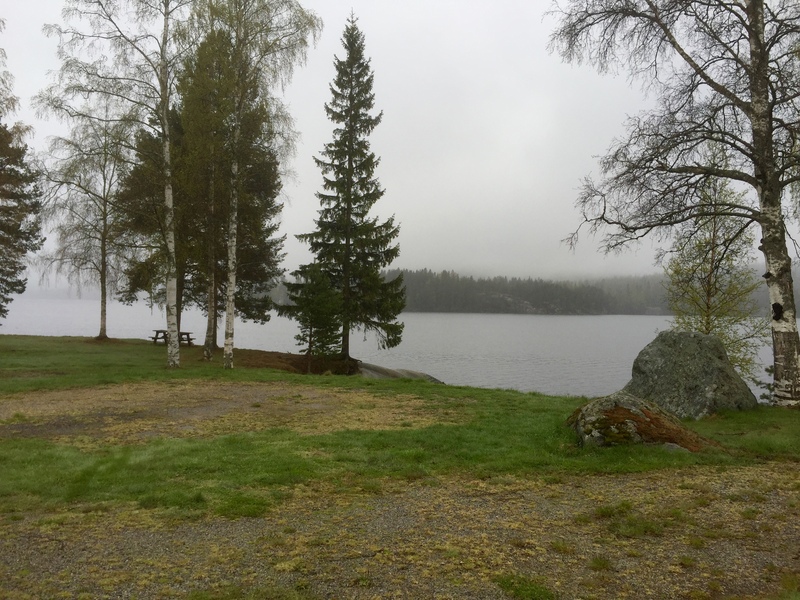 This meant a night of camping with no facilities cost me 310SEK altogether. 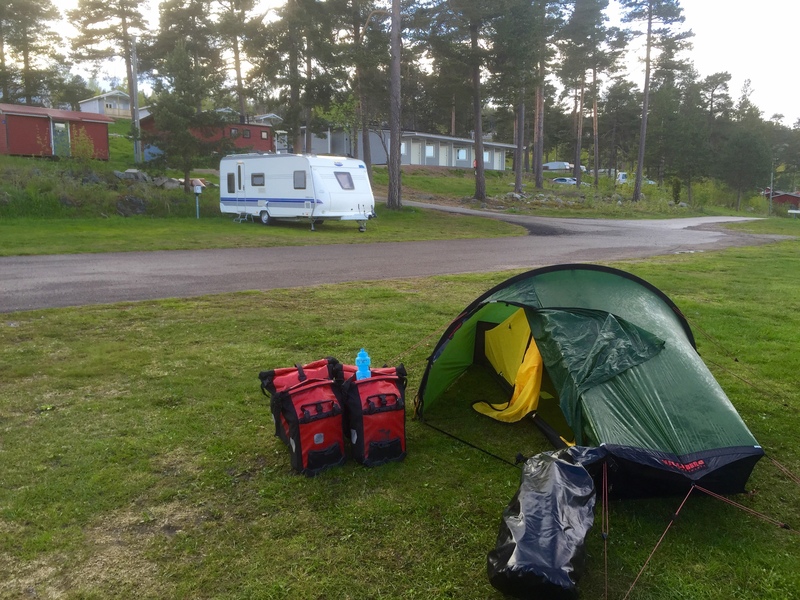 I should have just wild camped, although the card will hopefully be useful elsewhere in Sweden, as you need to have them for a lot of campsites; not sure why. Pedalling out I passed a backpacker who’d been staying at the campsite too, marching resolutely into the city in the drizzle; we exchanged glances indicating mutual dislike of the rain and chill. I rode through the University area, which was awash with people on bicycles, attracting curious looks from pedestrians and cyclists alike, no doubt due to all my luggage and hopefully not my pirate look. 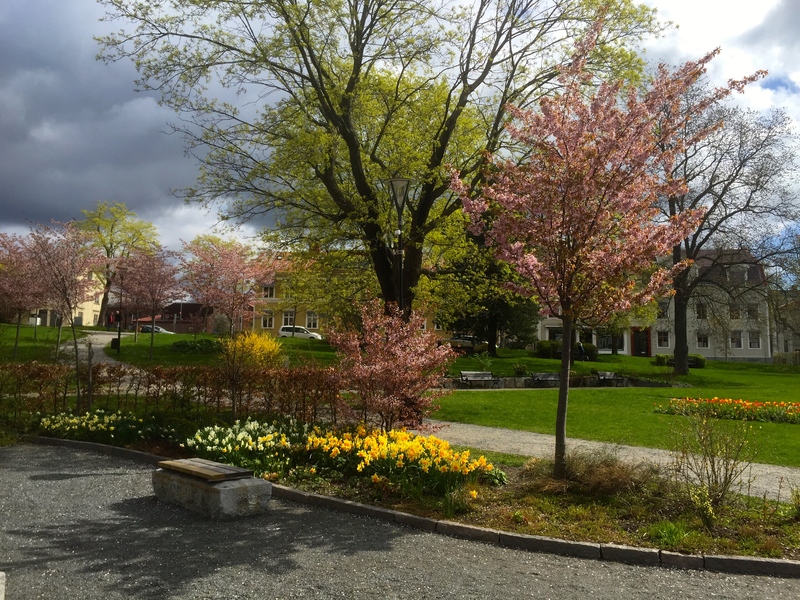 Umea, the biggest city in Norrland, has roots going back many centuries. It was probably first a Sami settlement, but they didn’t tend to have permanent bases, being nomadic. In the 14th century it was settled by Germanic people, but the Vikings were there before then. 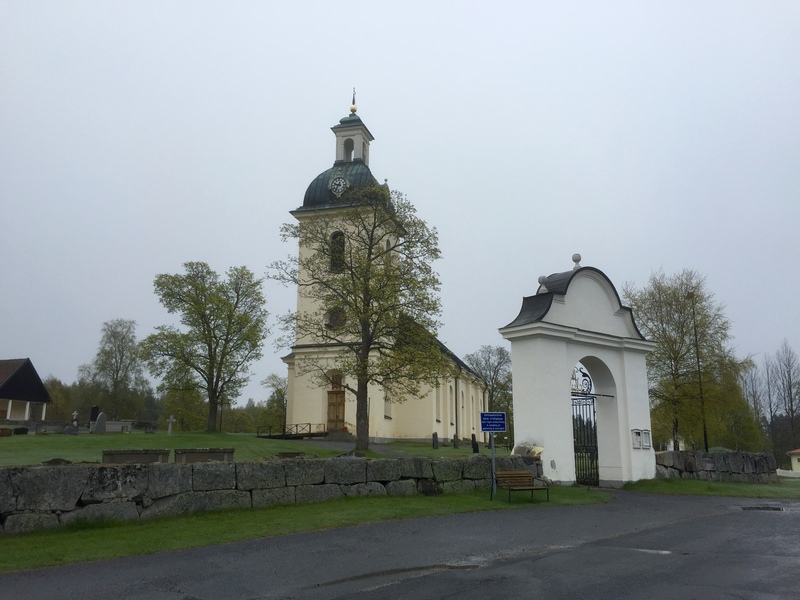 For a while it was just a place to trade with the Sami, and the last inhabitance before the wilds lot the North, but was made into a city in 1622. You can look up the rest on Wikipedia; it has an interesting history. 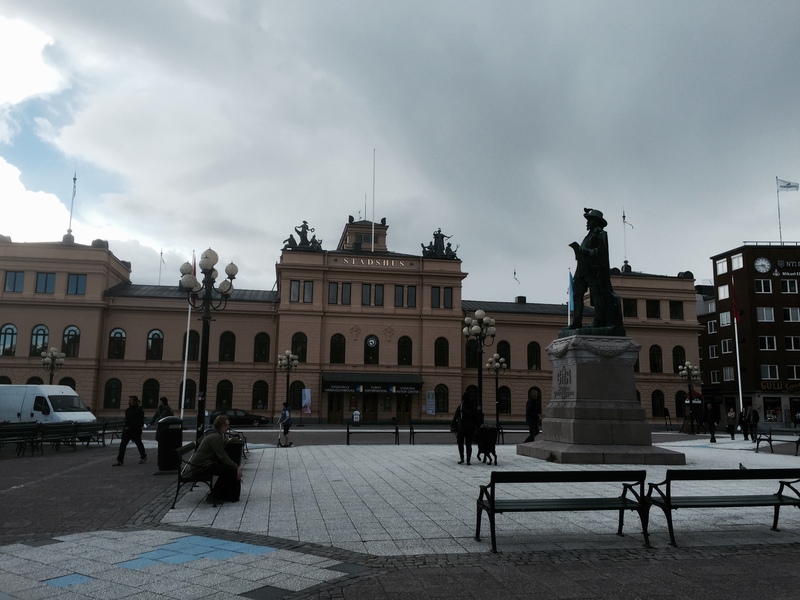 There’s all that history, and then there’s the fact it has a Mcdonalds, the first I’ve seen in Sweden. Whilst this is in some ways, slightly disappointing, in other ways, such as on a damp and chilly morning, it’s an important feature. I opted for a second breakfast to wait for the rain to ease off; it was meant to according to the forecast. The sausage and egg muffin and hot chocolate was a welcome calorie boost, and the free wifi a bonus. 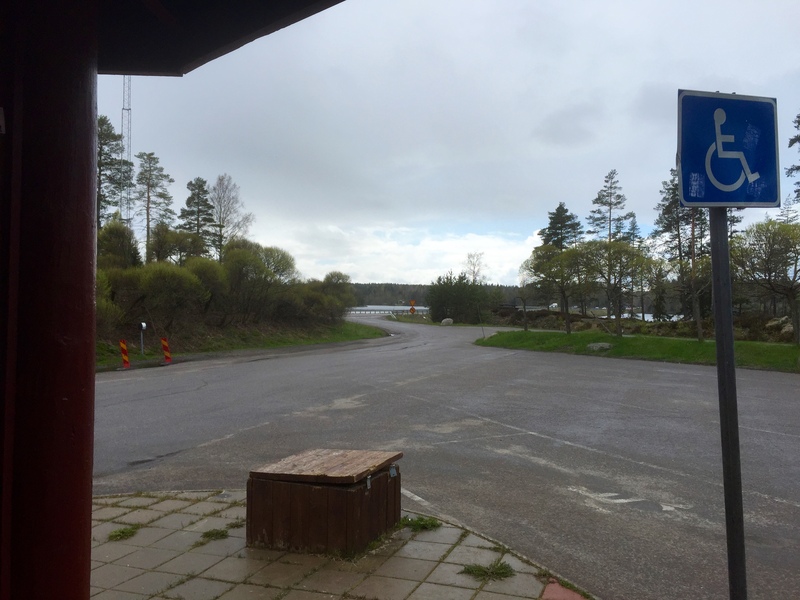 The rain eventually started to ease up, so I bid Umea goodbye and rode out of the city over the river, getting slightly turned about by the numerous and maze like cycle paths; they loop around under the roads and it’s easy to lose your sense of direction. Cycling must be a very popular method of transportation in Swedish cities, as there were again bikes everywhere. I eventually found the E04, joy, and passed the same backpacker trying to hitch a lift. He would’t fit on my bike, with all my panniers, but I wished him good luck anyway. I probably pedalled 15 to 20km more than I needed to today, due to taking roads running parallel to the E04, rather than staying on it for ages. I say 15 to 20km more, it doesn’t really matter, and the smaller roads are far more pleasant and interesting to ride on, however I don’t want to extend my route too much as I do have a bit of a schedule I need to maintain. After a couple of hours I took a break in the woods. And of course, there’s always time for a thumbs up moment. I crossed several bridges over fast flowing and turbulent looking rivers, which would no doubt be fun to raft or kayak down; I think I’d just capsize. At one point I decided to risk it and took a cycle track down a clay path through the forest, hoping it linked up with a road on the other side; this is after all supposed to be adventure. I’ve got a video of this I’ll try and upload, however here’s a picture in the meantime. The road surface was pretty claggy and slow, but traffic free and made for pleasant riding, aside from the odd sneaky pothole. 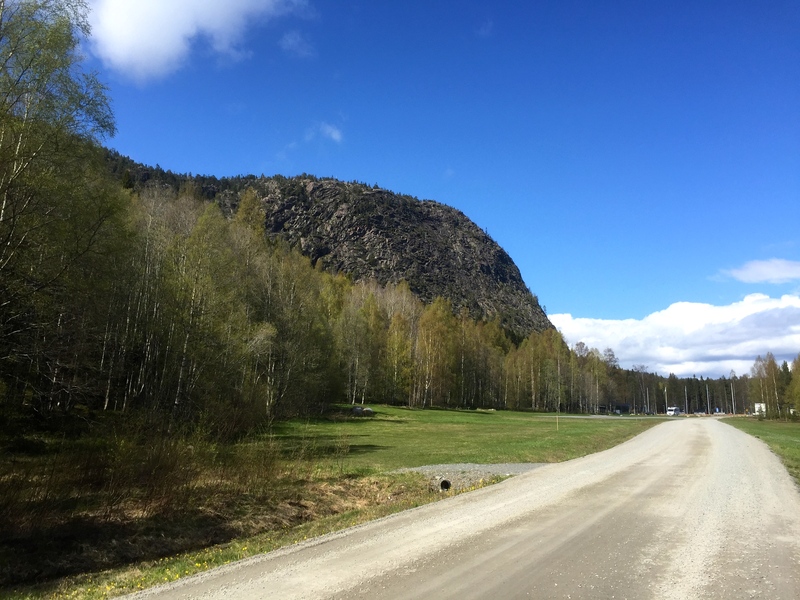 After a while I began to think I’d taken a wrong turning, but thankfully was able to join a fully functioning road near Nordmaling. 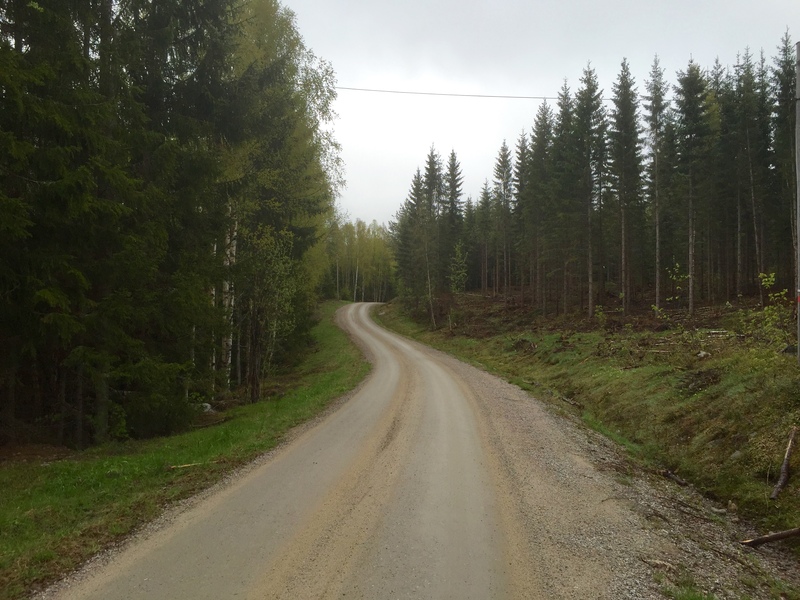 I continued to loop around the E04 on smaller roads, but eventually had to rejoin it after Logdea, as I ran out of options. It was okay riding, but again the narrow single lane bits where you’re enclosed by crash barriers can be unpleasant when you’re passed by the really big lorries, especially wide loads transporting houses! Some of these lorries come very close and there’s nowhere to go, so you just have to hold on and hope for the best; there’s probably more room than I think but it’s still not very nice cycling. As mentioned before the lorries also kick up a load of dust, so I was regularly having to wash my mouth out, and felt rather grimy by the end of the ride. 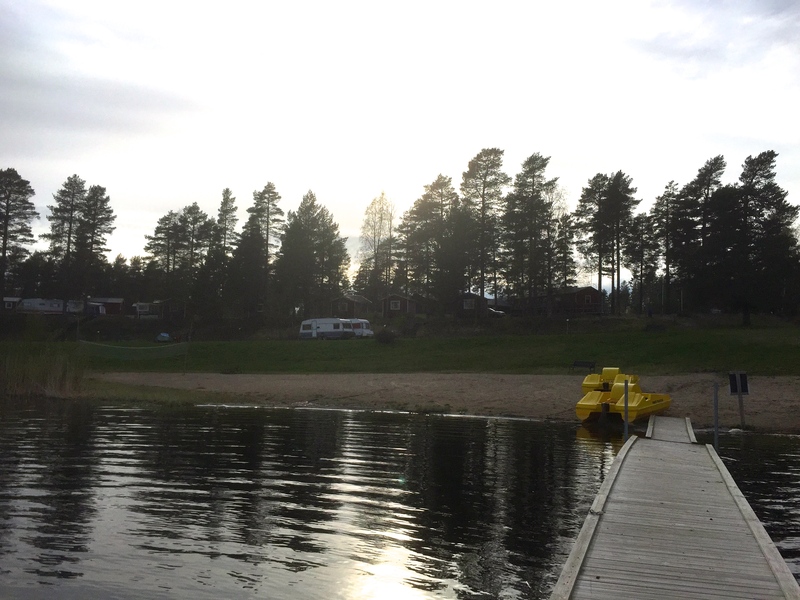 The Mosjon campsite sits on the edge of Mosjon lake, and looks to be a big fishing venue; lots of places in Sweden are big fishing venues. It’s a lovely spot, if a little close to the main road so you can hear the traffic. I was fortunate that the campsite owner turned up shortly after I arrived, as reception was closed. She needed to give a cabin key to the only other person here; I’m the only camper, which isn’t an unusual occurrence so far. Lots of campsites aren’t fully open yet, and won’t be until June. A hot shower to wash away the day’s grime and dust was most welcome, as is the warm kitchen for typing this up in, and to cook up a noodle feast. I’m trying to dry a few clothes I’ve washed through, but it’s not working too well; can I microwave them?! 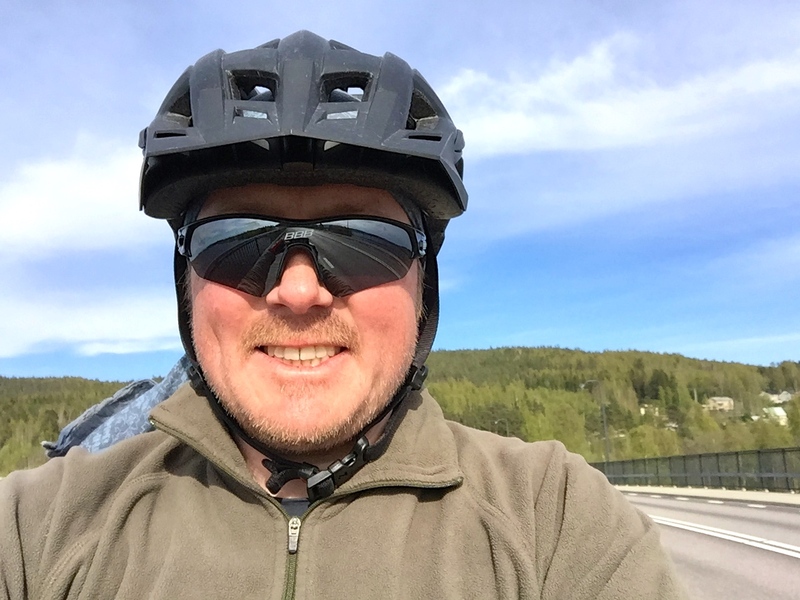 I’m in the High Coast area of Sweden now, a World Heritage Site, so I’m hoping for lots more beautiful scenery, coupled unfortunately with a few more hills to contend with. I did my best not to fall in the lake. The High Coast is so named because it’s slowly rising at about 8mm a year, after being massively compressed by the last Ice Age. Lots of cool wildlife to look out for tomorrow, including Beavers. 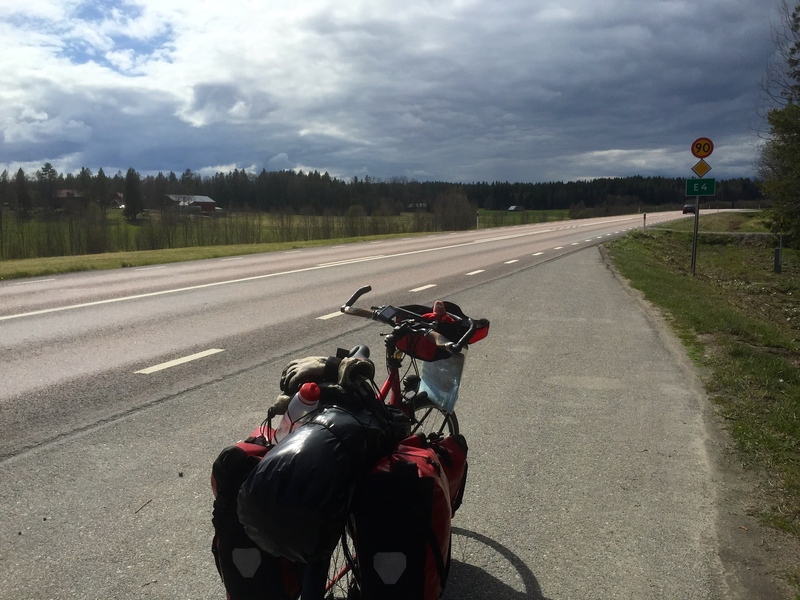 That’s all for today, tomorrow I head towards Sundsvall, probably stopping in Harnosand. One thing, on cycle tours you have a lot of time to think, and sometimes sad thoughts can return. Yesterday I spent quite a lot of time thinking about Lu, my ex-wife and best friend, who passed away from cancer in 2012. Sometimes you just want to meet them for a coffee and tell them what you’ve been up to, and even though that’s not possible physically, I rode along telling Lu about my latest adventure anyway. I started off sad, then got inspired and motivated and pedalled on, one of the reasons I hit 100 miles yesterday. Thanks to those who’ve already been able to make a donation. 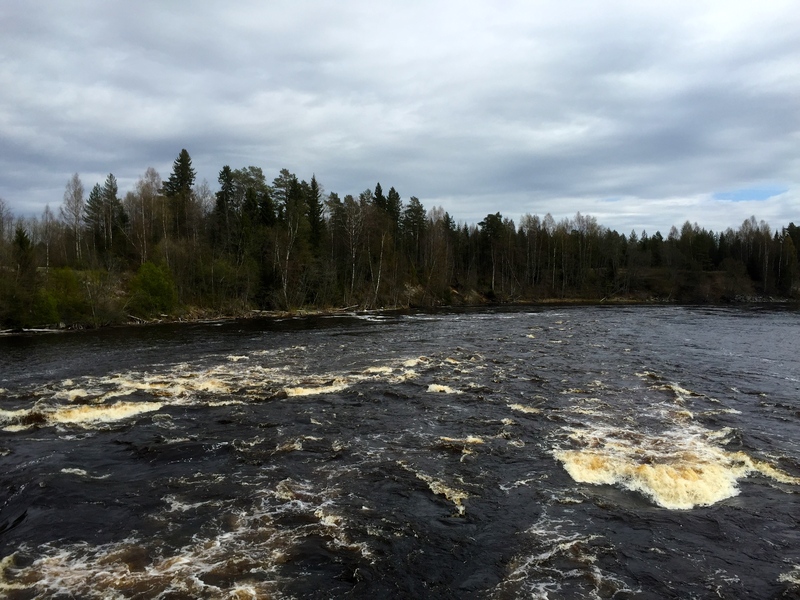 This entry was posted in Self Propelled 2015, Sweden and tagged Adventure, Baltic, Bicycle Touring, Bike, Byske, Charity, Countryside, Cycle Touring, Europe, Expedition, Gulf of Bothnia, photos, Self Propelled 2015, Sweden, The Big C, Umea on May 18, 2015 by SelfPropelled.